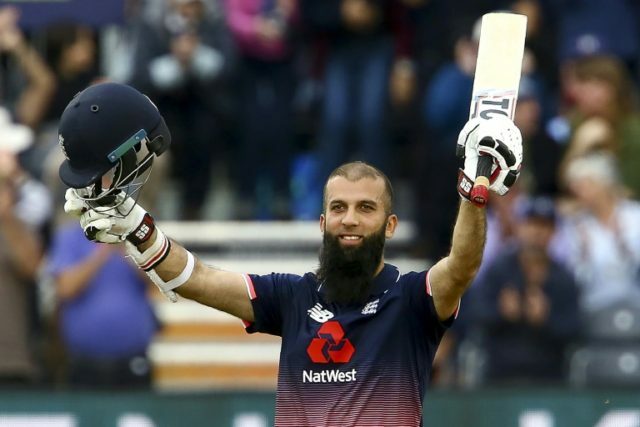 Bristol (United Kingdom) (AFP) – Moeen Ali’s blazing century set up England’s 124-run victory over West Indies in the third one-day international at Bristol on Sunday as the hosts went 2-0 up with two to play in a five-match series. Ali’s 53-ball ton — with his second fifty coming off just 12 deliveries — was the cornerstone of England’s imposing 369 for nine. West Indies were in with a chance so long as the big-hitting Chris Gayle was making 94. But when the veteran opener, who missed the rainswept no-result in the second ODI at Trent Bridge on Thursday with a hamstring injury suffered warming up on his 38th birthday, was run out the tourists’ hopes of winning disappeared with him. West Indies were eventually dismissed for 245, with fast bowler Liam Plunkett taking five for 52 — his maiden ODI five-wicket haul — as England won with 65 balls to spare. Earlier, all-rounder Ali sprinted to his hundred with nearly half of his runs coming via eight sixes, before he fell for 102. His century also included seven fours, with the left-hander needing a mere 12 balls for his second fifty. England’s total was their largest in a one-day international against West Indies, surpassing their 328 for seven at Edgbaston in 2009, and their fifth-largest in this format overall. Man-of-the-match Ali’s hundred was also the second quickest by an England batsman at this level after Jos Buttler’s 46-ball ODI century against Pakistan in Dubai in 2015. England lost three wickets for 11 runs to be 217 for six in the 35th over. But a partnership of 117 in 76 balls between Ali and Chris Woakes (34) turned the tide in a match that featured 28 sixes in total. Joe Root (84) and Ben Stokes (73) had laid the platform for a large total with a fourth-wicket stand of 132 in 20 overs. With Ali leading the charge, England scored 123 runs in their last 10 overs after being sent into bat. Ali’s six-hitting assault really got going as England scored a remarkable 50 runs in two overs — the 45 and 46th of their innings. He should have been out for 87 when he smashed a Jerome Taylor full toss to point only for Gayle to drop the catch at point. Ali went to his century with two sixes in three balls off Miguel Cummins — a pull over deep square leg followed by a soaring drive over long-on. He eventually holed out off spinner Ashley Nurse and received a standing ovation from a near-capacity crowd. West Indies opener Evin Lewis hit two sixes in David Willey’s first over before the left-arm quick had him caught at mid-on by Ali. Plunkett then had both Shai Hope (20) and Marlon Samuels (11) caught behind. But while their was no doubt about Hope’s nick to wicket-keeper Jos Buttler, England needed a review to see off Samuels. Technology indicated the merest edge, seemingly insufficient to overturn an on-field decision but enough in this case for Australian third umpire Rod Tucker to rule in England’s favour. Gayle, who wrote the book on one-day power hitting, struck off-spinner Ali for three straight sixes in as many balls while the floodlights pierced the increasing gloom. But the wicket England wanted came when Gayle just failed to beat Adil Rashid’s direct hit from midwicket and was run out, having faced 78 balls including nine fours and six sixes. Gayle’s exit left West Indies 176 for four in the 27th over and there was no way back for the tourists. England’s star men combined to end the match when West Indies captain Jason Holder (34) holed out off Plunkett to Ali at long-off. The series continues at The Oval on Wednesday.